The Calamondin tree is a hybrid, x Citrofotunella microcarpa and it is one of the best small citrus trees for the home garden. Readily available for sale at good nurseries and garden centres this is a tree with good glossy green foliage, fragrant flowers and attractive fruit that is used for a variety of purposes. Sometimes called the Calamondin Orange, or Miniature Orange this is a little misleading, as the fruit is not edible unless cooked, and does not really taste like an orange either. This is tree with both ornamental and culinary uses. The tree itself is attractive with the glossy foliage and colourful fruit. The fruit is used to make jams, jellies, marmalades etc. It is also used to make and flavour piques and brandies. Calamondin trees are often grown as standards when grown in containers. The top is pruned to a large ball shape by tip pruning a few times a year. The Calamondin tree is perhaps the best indoor citrus tree of all. Before planting dig over the soil well and add some well rotted compost and aged cow manure. 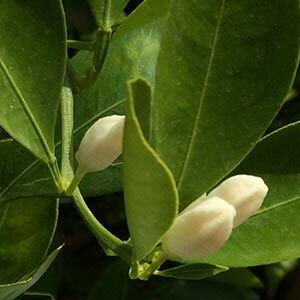 Ensure that the Calamondin tree is planted at the same level in the soil that it was in the container. Firm in and water in well with a liquid seaweed fertiliser to help promote good root growth. If planting in a container use a good quality potting mix with moisture retentive additives. Use a container that is of a good size, look for a deep container at around 70cm across. Look for a position that is not subject to strong winds. 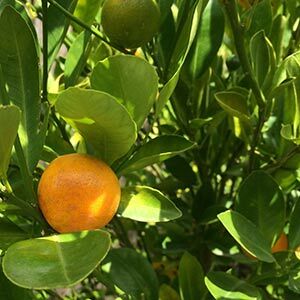 Fertilise in spring and again in summer with general purpose citrus fertiliser. When fertilising keep the fertiliser away from the base of the trunk. Always water before and after fertilising.